I keep hammering away at the GOP’s preposterous cut-and-grow plan—that the economy will really begin to grow and create jobs only after slashing spending to the bone—but that’s because people are still buying what the Republicans are peddling. The following analysis, however, should once more put to rest any ideas that cut-and-grow is the right course for this country. 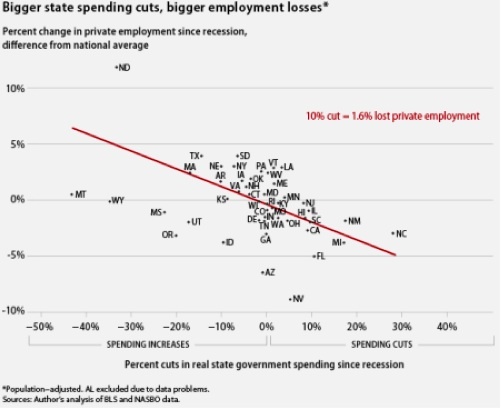 Using a nifty chart, Adam Hersh, an economist at the Center for American Progress, plots out states that have slashed spending and states that have increased it, and then shows how well their respective economies have fared. Via Adam Hersh, Center for American ProgressAs Hersh notes in this accompanying post, states that boosted spending saw decreasing unemployment and increasing economic growth. Those who cut back saw the opposite happen. It’s one thing for governors such as Florida’s Rick Scott, Wisconsin’s Scott Walker, and Ohio’s John Kasich to enact publicly unpopular policies that ultimately help their states. (And boy are they unpopular.) It’s quite another to do so when the data shows that you’re only shooting yourself in the foot. The question is, when will Republicans in Washington figure this out? Who’s the Most Unpopular Governor in America?